Harry Beautyman of Posh challenges West Brom's James McClean for possession during the FA Cup fourth round tie at the Hawthorns. Photo: Joe Dent/theposh.com. MIdfielder Harry Beautyman insists Peterborough United’s promotion push will not be de-railed by their excellent run in the FA Cup. 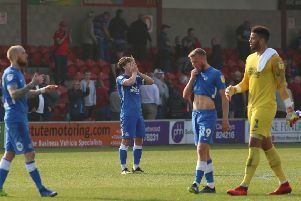 Posh have slipped to 10th in League One following back-to-back defeats against high fliers Gillingham and Burton Albion. Posh have also lost ground while fulfilling FA Cup commitments. They drew 2-2 in a fourth round tie at Premier League West Brom last Saturday (January 30) and face a replay at the ABAX Stadium next Wednesday (February 10) which will be shown live on BBC One. “Those two league defeats haven’t damaged our confidence or self-belief. “We know we are good enough to get back into the thick of the promotion race, but we also know we need to win a lot of games between now and the end of the season. We have no option. Beautyman played in last night’s (February 2) 5-1 reserve team win at St Neots, as did deadline day signing Tom Nichols. Nichols is expected to be on the substitutes’ bench at Chesterfield. On-loan left back Harry Toffolo is back in training after missing the game at the Hawthorns with a whiplash injury and should return to the starting line-up at Chesterfield.